Cristina was in Cape Town and received a call. Through the CES, the project that we visited there, was introduced to us and they asked us to make a video and some photos for their website! We were delighted, of course. Above all, after seeing what they do. To train people so that they can reduce their food insecurity with urban gardens. An ecological way of being nourished and an alternative to the industrial and global mediums of producing and distributing food. In the car with Sandi, we travel some of the many kilometers of townships in Cape Town. Slum, slam, shanty town… different names for an international phenomenon, whose existence we are unfortunately accustomed to, until the point where Cape Town forms a part of the package for sightseeing tours, in a nutshell. Everything is made up of gray sand and is sterile; gray outside and inside. Apathetic gray, gray from a lack of opportunities, gray without hope, because the past is gray and also the future. Here, in the middle, we see a green and colorful oasis. Green vegetables and red peppers and even yellow flowers. In Charles’ case, with the help of Soil for Life, he has assembled a garden in his house, that not only gives him a source for eating, it gives him encouragement, self-esteem, pride, and hope. It is only one example of the work done by Soil for Life, that devotes itself to teaching, to everyone who is interested, like how to grow food in an ecological way in their homes and even how to make compost and use their own seeds. And the “Home Food Gardening Program” is a program that focuses on how to make it in the townships, where training has to be financed and the gardens need more monitoring. Pat, one of the people leading the project, speaks mostly about insecurity. Apart from violence or criminality. The people in the townships don’t know what they are going to eat the next day nor where this food will come from, they don’t know if they will be able to buy clothing or if they will be able to pay for their childrens’ schooling. They cross their fingers, hoping that no one gets sick or a toothache, or that nothing gets broken in the house. That’s why the keywords here are Food Security. And security that is achieved through autonomy and sustainability. It becomes evident that the ecological is allied with social development. Neither fertilizers nor seeds go into these gardens, and the containers that are used are recycled. Thus the gardeners do not need money for maintaining and growing their gardens. The soil nourishes itself, it doesn’t degrade and also becomes a productive surface that wasn’t there before. And Soil for Life makes an effort to offer complete training and to create educators so the gardens can work. We insist on using an autonomous and sustainable way. We believe that the “Home Food Gardening Program” is very powerful. The people learn something new, it is very creative, and they become aware of the spaces with potential for farming that are much more than what one would think. Furthermore, Soil for Life is building awareness of the local environmental and global problems through something practical. It alleviates poverty, not by giving but by offering tools so the people can be self-sufficient while implementing an alternative form of nourishment. An ecological alternative, but also an alternative outside of the system of production and distribution of food dominated by a handful of multinationals that operate in an oligopolistic setting and usurp the profit margins that belong to farmers, ranchers, small traders, and consumers. 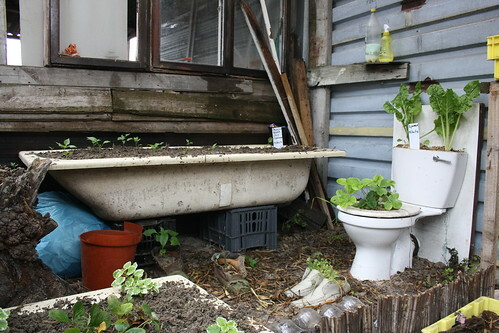 An alternative, the urban garden is totally replicable in a wide range of contexts. It is a feasible alternative for partly substituting the way in which food is created and distributed, formed by many little corners in opposition to the supermarket and many protesting flowerpots in homes. We invite everyone to be creative and place a little bit of chewable green in their home, even if it is on the ground.